Moscow, Aug 01: A top Russian defence industry official has resigned following delay in delivery of the overhauled Russian aircraft carrier Admiral Gorshkov to India amid reports cost escalation may have led to the decision. Russian officials confirmed the resignation of Director General of Russia's top nuclear submarine building shipyard 'Sevmash' Vladimir Pastukhov " due to slippage in repair and modernisation schedule" of Admiral Gorshkov but tried to play down the financial aspect. Nikolai Kallistratov is to be appointed the new Director General of 'Sevmash' to replace Pastukhov. He is currently DG of another "Zvyozdochka" submarine repairs shipyard located in the same White Sea port city of Severodvinsk. At the time of signing of the USD 1.5 billion Gorshkov deal in 2004, Pastukhov had expressed doubts whether the overhaul costs could be met by his shipyard at the price negotiated by India. However, due to the weakening of US dollar and unprecedented strengthening of Russian rouble, all the local enterprises including military-industrial complex working on export orders are shifting to the euro and raising the annual rate of cost escalation. Russia has also asked India to review prices of all the ongoing defence deals with India, including Gorshkov and Sukhoi deals by calculating prices in euros and doubling the annual cost escalation to five percent. Defence Minister A K Antony is reported to have written in confidence to his Russian counterpart Anatoly Serdyukov about New Delhi's proposals to tackle the issue. Diplomatic sources said the price issue may be resolved by October when Antony and Serdyukov are scheduled to meet in Moscow for the regular session of inter-governmental commission on military cooperation. Industry sources said cost escalation was a factor behind Pastukhov's resignation while officials seemed to indicate some other reasons. The decision to appoint a new chief of "Sevmash" is linked to several reasons including plans for its incorporation into the united shipbuilding corporation, Itar-Tass reported quoting an industry official. To a great extent the decision to replace DG of Sevmash was influenced due to the slippage in execution of Indian Navy's contract for the construction of aircraft carrier Vikramaditya on the basis of Admiral Gorshkov, the official was quoted as saying. According to Izvestia Eveninger, the Gorshkov delivery could be delayed at least for another four years due to insufficient financing and poor management of the project. "The aircraft carrier is being overhauled at the shipyard, but, unfortunately, the funds allocated for the work under the contract are not sufficient and we will have a hard time to meet the schedule," the Izvestia quoted Sevmash acting Director Eduard Borisov. The contract signed in January 2004 covers the modernisation of the aircraft carrier and equipping it with modern weaponry, including the MIG-29k fulcrum aircraft and Kamov KA-27 Helix-A and KA-31 helix-b anti-submarine helicopters. "We are practically building a new ship using an old hull and changing everything else," Borisov said, adding that the company's management had earlier made an incorrect assessment of the modernisation cost. hello folks can some one tell me the current status of the 20350 stealth frigate project? in short, Project 22350 Admiral Gorshkov's hull is ready, superstructure will be finished this year, next year it should be stuffed with equipment, with sea trials scheduled for 2011. This year one more 22350 keel can be layed. Attached are official images from keel plate and commemorative sign, plus two images with more on less official sourcing. No images of ship under construction were ever released, eiher officially, or unofficially, to this date. 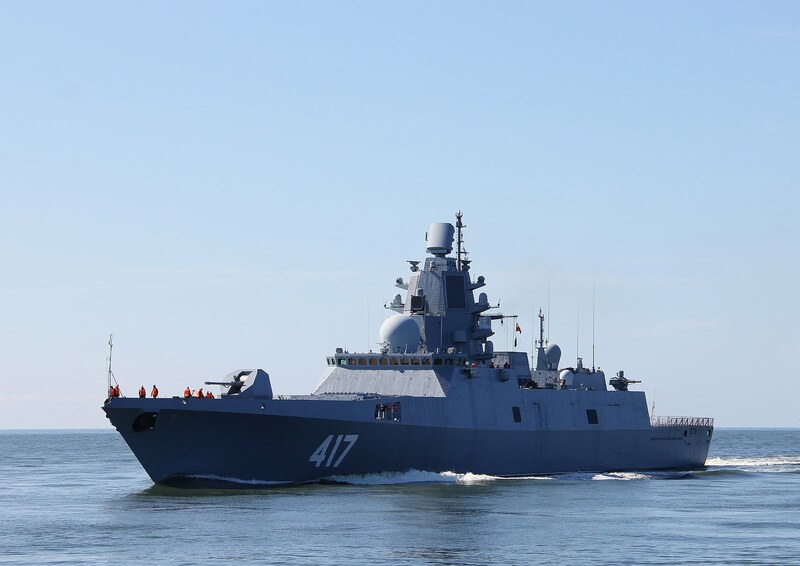 The build status of the Russian Navy's third- and fourth-in-class Project 22350 Admiral Gorshkov-class frigates may be delayed as Russia contends with sourcing an indigenous propulsion plant supplier following Ukraine's ban on military exports to Russia. The lead vessel Admiral Gorshkov and second-in-class Admiral Kasatonov are powered by two M90FR gas turbines designed and built by Zorya-Mashproekt in Ukraine. Russia's NPO Saturn collaborated extensively with the Ukrainian turbine maker before the ban and will now build the M90FR. However, the status of power plants for Admiral Golovko and Admiral Isakov is unclear, and the timetable for completing these ships may be extended. Under the Russian government's import substitution programme, it is understood that NPO Saturn is supposed to develop the capability to produce and test the M90FR by 2017. Here I leave the link of my latest work on the Project 22350 Admiral Sergey Gorshkov, the most extensive compilation in Spanish, I hope you like it, if you have a correct or contribution That the best, in advance very grateful, is mentioned in a section of thanks for contributions made of the blog. I'd be happy if the new US Frigate were even half as impressive.